Difficult opening contests, there were few more difficult than the challenge which faced Gu Yuting as she started her quest for a place in the Seamaster 2018 ITTF World Tour Lion Japan Open in Kitakyushu. On Thursday 7th June in the Women’s Singles qualification tournament she faced Chinese National Team colleague, Feng Yalan, a player in whose footsteps Gu Yuting to some extent treads. Coincidentally both in Africa, Feng Yalan was crowned World Junior champion in 2006 in Cairo; seven years later Gu Yuting succeeded in Rabat. 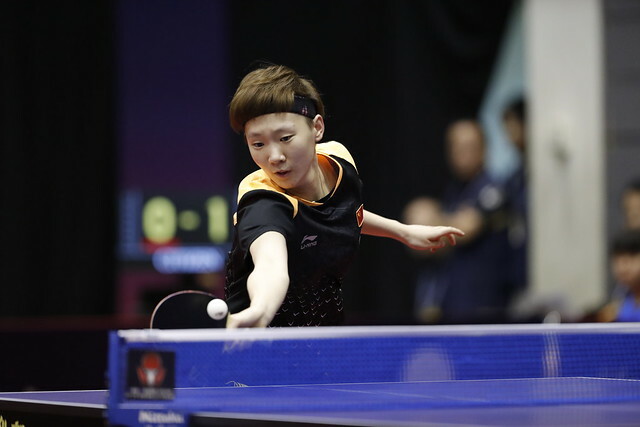 Furthermore, Gu Yuting seeks her first ever ITTF World Tour Women’s Singles title; Feng Yalan has three to her name; in 2010 she won in Germany notably beating compatriot Ding Ning in the final, having the previous day won the Under 21 Women’s Singles title.Later in 2012, she succeeded in Kuwait and Russia. A tough adversary most certainly and Gu Yuting responded; she beat Feng Yalan in six games (6-11, 12-10, 7-11, 11-6, 11-5, 11-2). A hard fought win for Gu Yuting, it was the same for Slovakia’s Barbora Balazova. She eventually overcame Korea Republic’s An Soyeon by the very narrowest of decisions (9-11, 11-9, 11-7, 6-11, 3-11, 12-10, 13-11). Defeat for An Soyeon but there was a notable success for Korea Republic; Kim Haeyong, listed at no.419 on the current Women’s World Rankings, accounted for England’s Tin-Tin Ho, listed at no.96 (11-4, 11-7, 11-6, 11-7); the win being one of three upsets as play in the second round of the Women’s Singles qualification tournament came to a close. The others were those recorded by Norway’s Ma Wenting against Spain’s Galia Dvorak (11-9, 11-4, 11-4, 11-7) and the all Chinese Taipei battle when Lee En-Chi accounted for Huang Yi-Hua (11-8, 11-4, 11-6, 8-11, 8-11, 11-6). Presently on the Women’s World Rankings, Ma Wenting stands at no.284, Galia Dvorak at no.87; similarly, Lee En-Chi is at no.704, Huang Yi-Hua at no.110. Meanwhile, as the second Women’s Singles qualification round closed, in addition to Gu Yuting, the leading names emerged successful. Korea Republic’s Jeon Jihee and Yang Haeun both enjoyed success. Jeon Jihee beat Thailand’s Phantita Pinyopsian (11-8, 11-1, 11-7, 11-2); Yang Haeun accounted for compatriot Lee Daeun (11-5, 11-7, 11-5, 11-5). Similarly, not to be upstaged, Hong Kong’s Minnie Soo Wai Yam ended the hopes of Chinese Taipei’s Liu Yu-Hsien (8-11, 13-11, 11-4, 11-6, 11-6). The final preliminary round will be played later in the day.